Pena de Bernal also known as Bernal Peak is Mexico’s largest monolith located in San Sebastian Bernal, a small town in the state of Queretaro. The rock rises 350 metres above the town and was formed some 100 million years ago during the Jurassic period when it was at least three times higher than present day. The Rock of Gibraltar is an overseas territory of the United Kingdom on the southern coast of Spain at the entrance to the Mediterranean sea. It is basically a limestone monolith which is 426 metres (1,396 feet) high and is the home of 27,800 Gibraltarians and 250 Barbary macaques, the only wild primates in Europe. It is said in Greek mythology that Gibraltar was one of the Pillars of Hercules manifested on the edge of the Mediterranean and the known world. It is one of the most famous sights in Yosemite National Park. It is a granite monolith which rises almost 910 metres vertically from Yosemite Valley. It is a preferred challenge among expert rock climbers. Torres del Paine is a national park in the Extreme South region of Patagonian Chile and features mountains, lakes and glaciers. The centerpiece of the park are the three Towers of Paine; fantastic granite monoliths shaped by the forces of glacial ice. The highest peak is about 2,500 metres high(8200 feet). The Ben Amera is actually hidden in the desert of Mauritius. As per sources it is the second largest monolith in the world after Uluru. 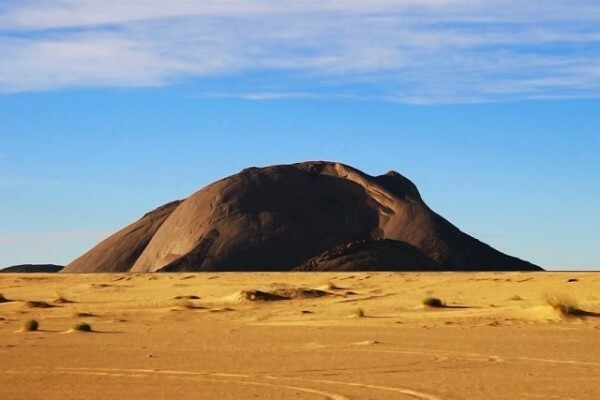 Ben Amera is located 5km from Tmeimichat, a small village on the route of the desert train between Nouadhibou and Zouerate. Devils Tower is the core of an ancient volcano exposed from erosion which rises 386 metres (1,267 feet) above the surrounding terrain. It is located in the Black Hills in Crook County, northeastern Wyoming and was declared a United States National Monument in 1906 by President Theodore Roosevelt. The mountain is also famous as the selected location of the alien-human rendezvous point in Steven Spielberg’s Oscar winning science fiction film, Close Encounters of the Third Kind. Sigiriya is a stunning 370 metres high ‘Lion rock’ fortress. It is one of Sri Lanka’s major tourist attractions. The Sigiriya rock is a toughened magma plug from an extinct and long-eroded volcano, similar to Devils Tower. From about the 5th century BC it was used as a rock-shelter mountain monastery and afterwards turned into a rock fortress by King Kasyapa.